Three days spent in the cold but sunny South of France tend to be more memorable than the same period in the damp of an English winter. When those three days also contain the chance to drive, examine or ride in the results of a giant mass-manufacturer's involvement in motorsport, then the occasion becomes worthy of less than casual recall. Renault were staging their annual motorsport press conference at the Paul Ricard circuit, and when Renault hold such occasions they display a sense of style and showmanship that can be quite beguiling ... especially when they spend part of their conference going through all the mechanical faults discovered in their Formula One and Le Mans products, and how these problems were tackled. Most manufacturers would be happier to tell you nothing went wrong! The main story was that of Rene Arnoux taking the second Formula One seat, an announcement that was greeted with spontaneous and hearty applause after two hours' restive listening to everything else Renault had to say. 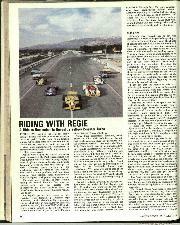 La Regie's sporting involvement in 1979 stretches from Renault 4 autocross type machinery to the ubiquitous R5 one-marque racing (which takes in most European countries, including Britain); Renault-Elf-Winfield single-seater driving schools at Ricard and Magny Cours; Formula Renault, and a possible Formula Three Renault France Challenge. 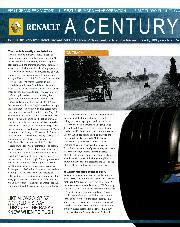 Above these promotional formulae, which depend on either all-Renault basis or Renault engines, the company place their participation in the European Formula Three series, the World Rally Championship and, at the pinnacle, a two-car Formula One effort by Monsieurs Jean-Pierre Jabouille and Arnoux. When you think that just a straightforward British kit-car F1 team talk about one million pound per annum budgets to be competitive, the size of Renault's involvement as a manufacturer can be truly judged. Small wonder that they will not be returning to Le Mans in the foreseeable future: their turbocharged V6 engines will not be used at the Sarthe circuit next year by the Cluxton Mirage team either, so the Cosworth DFV has the chance of adding Le Mans to its increasing string of worldwide achievements. Renault's rallying involvement includes two fuel-injected R5 models for Jean Ragnotti and Guy Frequelin (who were second and third overall on last year's snow-stricken Monte) with an exciting long-term development of a mid-engine, 1.4-litre, Renault R5-turbo! This car is not a joke and we were able to examine one of two prototypes and see it running at quite a convincing impersonation of its claimed 260 b.h.p. The idea is that a production version may materialise and Renault attack the World Rally title again, but after success has/has not been achieved in Formula One. The same cornment came from competitions director Gerard Larrousse regarding the possible inclusion of a assault on the Indianapolis 500 by Renault. "Of course the 500 is interesting to us with turbocharged car, but these things must wait behind Formula One: that is the priority, and to have success we must all work for this goal." Although what Renault had to say was interesting, if a trifle prolonged before getting to the point, and though I always enjoy the chance of driving (the school cars were the scruffiest I have seen, but then so was the journalistic standard of driving, so perhaps justice was done!) there is only one really outstanding memory. That is of Didier Pironi grinning amiably as he precisely corrected a pronounced tail slide in the open Le Mans "hare" sports car in fourth gear as part of his truly fabulous demonstration performance for journalists. Providing the opportunity to sit alongside Pironi was an inspired piece of Public Relations work. Though the driver may have been bored to tears, most of the press men were sufficiently excited to exit the car with knees still trembling, voices too loud and tears of relieved laughter beginning to seep downwards over cold cheeks. I can say that the chance to ride in a turbocharged two-seater open car with a top GP driver demonstrating what skid control really means was an education. While you cannot share the performance of a Formula One car, this 500 b.h.p. plus machine does provide a closer idea of what can be achieved today. There was the choice of two sports cars. You could either take the car that actually won, a conventional A442 driven by co-winner Jean-Pierre Jaussaud (now out in the cold so far as Renault's future competition plans are concerned), or opt for the A443 which set the pace for most of the race, driven by Pironi on this occasion. 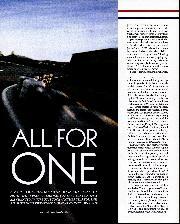 In the race Pironi/Jaussaud shared the winning A442, Jabouille/Depailler the A443. I chose the second car because Pironi's objective seemed to be simply to get each ride over with as swiftly as possible, starting with a rally style assault on the little hump-back bridge from pits to main track straight! Also on the side of the A443 was the fact that it retained the 2.1-litre engine instead of the 2-litre normally used. This allows up to 540 b.h.p. at 0.95 bar boost and, since the two cars weigh the same (715 kg./1,573 lb. ), I thought the acceleration would be keener in the winning car. In fact, turbocharged acceleration is so smooth that it is only the fact that the 14" wide rear wheels and plump Michelins are slithering and scrabbling for grip whenever hard acceleration is used in first, second and third that emphasises, together with the fact that someone has mounted the next corner on a giant catapult and projected it toward you, that these cars give the word "acceleration" a new personal meaning. The A443 was the culmination of a series of Renault Alpine sports/racing cars: now that their only destination is the company museum in the Champs Elysees, or equivalent, a resume seems worthwhile. The Renault Alpine A440 made its race debut at Magny Cours on May 1st, 1973. The overall shape was not that dissimilar to today's cars, though the subsequent Le Mans bodywork naturally featured much longer tails and the general trend has been toward a lower bodyline with side-skirts appearing in 1978. The general mechanical concept was similar with a V6 motor of 2-litres mounted in the mid-position behind an open cockpit, but the motor was not turbocharged originally. The glassfibre panels enveloped a monocoque chassis, the whole conforming to Group 6, the World Championship of Makes at the time. The A440 weighed just 575 kg (1,265 lb.) and the 1,997 c.c. V6 provided a claimed 285 b.h.p. at 9,800 r.p.m. 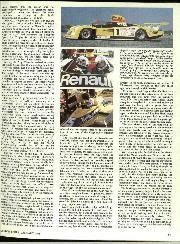 The return of Renault to sports car racing took an added fillip from a victory at Croix en Ternois. In 1974 the model became the A441 or 441C and contested the European Sports Car Trophy for 2-litres with Renault's Alain Serpaggi emerging as the title holder. In seven qualifying races the car took seven steam-roller wins against mainly British opposition with derivatives of the Cosworth 16-valve four-cylinder motor. Overall weight had grown by just 10 lb., a Hewland FG400 gearbox replaced the same firm's FT200, and the engine acted as a semi-stressed member of the chassis. In 1975 the A442 V6-turbo arrived to contest the World Sports Car Championship, but had a disastrous season, just a win at Mugello and two top-three placings to encourage them into 1976. The weight of the turbo model was 685 kg. (1,507 lb. ), but the 2-litre capacity now brought a claimed 500 b.h.p. from the four-valve-per-cylinder, 90-degree vee-motor. An engine which also features double overhead camshafts to each bank of cylinders (driven by toothed belts, unusually in a full-blooded competition design) and a cast iron cylinder block underneath the aluminium heads. For 1976 the A442 begun the hunt for a Le Mans victory, as well as surviving as a programme after that incredible first-corner Nurburgring accident when two A442s collided! The long-tail shape for Le Mans arrived: underneath the cars continued to be sturdily constructed along fatter single-seater racing lines, though the side-radiator design had outboard rear disc brakes - cross-drilled as well as radially ventilated along the same principles as those at the front. Compared with the 1975 design, the aerofoil was smaller and the back wheel rim width up: 15" wide by 13" diameter. For Le Mans itself the rim width went down to 14", but the diameter was increased to 15". Weight in Le Mans trim was put at 715 kg. (1,573 lb. ), or 33 lb. less for World Championship rounds. Part of this can be attributed to the larger fuel capacity used at Le Mans, 160 litres instead of 120 litres. The A442 served as the basis of Renault's assaults on Le Mans from 1976-78. There were three on hand this year, and it was fitting that one should achieve victory. 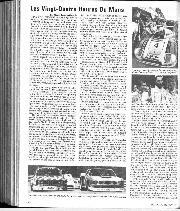 Renault finally beat Porsche in a 24-hour event during which they were not headed by any other marque. The car that made that start-to-finish monopoly possible was the A443. Announced 15 days before the race after hurried testing on the Michelin track and for straight-line speed at an airfield site, the A443 shared the mechanical layout we have discussed, but offered three incentives to very high speed on the long fast sections at Le Mans: revised, and even longer, body; a cockpit bubble (deleted for the race); and a 2.1-litre version of the V6. The engine was stretched by incorporating an extra 3 mm. in the stroke leaving the 2,140 c.c. motor a bore and stroke of 89 x 57.3 mm. In racing trim the bigger engine is said to allow an extra 40 b.h.p. over that of the 500 b.h.p. 2-litre. As before the Garrett AiResearch turbine unit is mounted above the transmission in the tail of the car, pipework stretching thence up to the bottom of an air to air intercooler, which is installed behind the cockpit bulkhead. The cooled air is then delivered to the top of the intercooler and released via two shorter tubes to be conducted into either bank of the Kugelfischer injection system. The straight-line speed of the Renaults was distinctly higher than that of the Porsches at Le Mans in 1978. 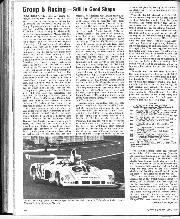 In practice Stommelen did manage to urge a twin-turbo 935 to 227 m.p.h., but in the race the Renaults, the winning car at least, were regularly the right side of 220 m.p.h. In practice Renault tried the A443 with the bubble of clear plastic over the cockpit, and without: the claustrophobic top provided a speed of 227.9 m.p.h. Taking the bubble away lowered the maximum speed to 215.5 m.p.h., but the lap time was raised by less than a second, so drivers Jabouille and Depailler were allowed their way and it was removed. However, the winning car was equipped with the clear canopy and surrounding bodywork, and that accounts for its regular clearing of the 220 m.p.h. hurdle in the race. Our demonstration was without the canopy on the A443 for obvious accessibility reasons. One of the achievements of the A443 was to travel fast enough to break the opposition. Before its official retirements at exactly three-quarters distance, the 2.1-litre had set a new official lap record in Jabouille's hands of 3 min. 34.2 sec. (142.32 m.p.h. average). Lowering myself into the cockpit of the A443 beside Pironi I did wonder if I had made the sensible decision, but I was at least prepared for the fact that the ride started the second the belts were clinched on my side and would go on in full-blooded style until the entry of the pits, three laps later. A shorter circuit layout than for the GP was in use, but this still allowed a reasonable straight to be used, approximating to that of Silverstone Club because of the slow speed approach through a righthander. With my feet curled up in what felt like a very exposed position in the extremities of the front bodywork and well away from the maestro's pieds, I felt the start rather than looked. There was quite a sharp belt in the back and we flew up and over the hump with a gusto that was matched by the thump on swooping down the other side. Ricard as a course lacks any further opportunities for crests and dips, but Pironi made sure that all of us got a good look at the kerbs, for all but a couple of corners face the passenger to the outside as the driver keeps turning right. The first sheer shock of all that cold air pouring in at increasing speed, and the enormous loads your hands must take in cornering to prevent you falling over the driver, disappears with a determination to see what this man is doing that makes him different from us. The first point is that the car asks for a special technique with plenty of turbo applied in mid-corner to make sure the boost needle is quivering on maximum as the car hits the straight. 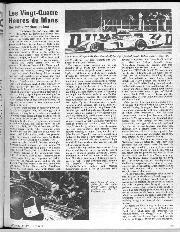 With so many miles behind him at this circuit and at Le Mans in such cars, Pironi drives with deliberation through the gears, changing quite slowly, but the steering and throttle movements are another story. The sheer amount of opposite lock applied amazed me, the feeling through the aforementioned lefthander (at some 130 m.p.h. or so at a guess) was of a top class Finn at the wheel, for the chassis just keeps sliding, the driver's deft hands pointing the steering one way while the whole car drifts through a lazy arc at increasingly larger slip angles as Pironi firmly demands more than the chassis has to give. The braking seems natural, but this is because of our pilote's prowess; he just knocks the speed off in smooth bursts of the pedal on the sunlit but greasy track. The braking power is terrific, but no drama is passed to the passenger, who waits enthralled for the oversteer exit and subsequent rush along the straights. The most I saw the car reach on the main straight was 8,600 r.p.m. in top (10,000 r.p.m. in the gears): this was reached in my personal braking area for a Renault-engined F3 car subsequently driven. The confidence inspired by such a driver left me wishing we could break 200 m.p.h. together at Le Mans, for it is an experience otherwise unlikely to come my way! - J. W.